Casa Italiana Zerilli Marimò, the home of Italian culture at NYU, is now hosting a unique photographic essay by the title Emotions from Pisa by Stefano Pasqualetti. The pictures will be on view until April 29th. There is more to Pisa than the famous Leaning Tower and you can see that at Casa Italiana Zerilli Marimò. 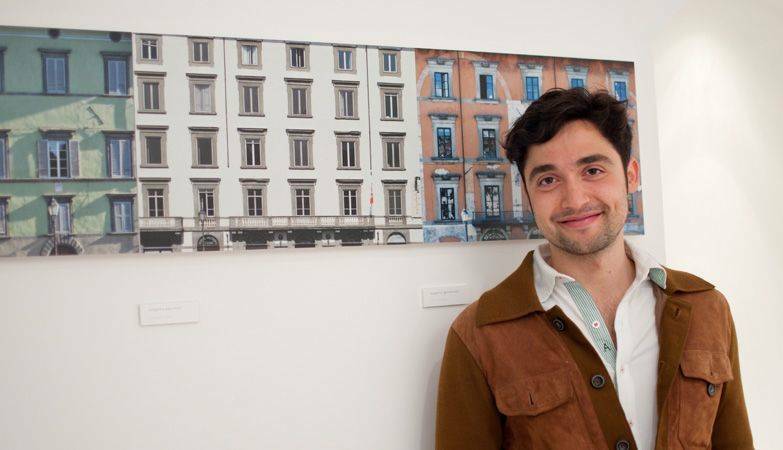 Indeed the home of Italian culture at NYU is now hosting a unique photographic essay by the title Emotions from Pisa by Stefano Pasqualetti. The pictures will be on view until April 29th. Pasqualetti is an architect who resides in Manhattan since 2011. This is his first solo exhibition. “Pasqualetti shows us the Pisa that we know and above all a Pisa that we never noticed. ...This collection of photographs also demonstrate how architecture, through its forms and its surfaces, can evoke emotions that are constantly changing, as sun and seasons take their daily and yearly paths,” Professor of architecture at Scuola Normale Superiore of Pisa Howard Burns writes in the preface of the book that accompanies the show and groups together all the images in a meaningful visual essay. In his introduction to book, when asked to explain his photographs, Pasqualetti himself replied that it is “impossible.” When asked if his is an attempt to impart information, he replied “unthinkable,” yet we were able to get some answers from him. Slide show "Emotions from Pisa"
Yes I was born and I grew up in Pisa. Each and every event of my life story took place in the streets, alleys and squares of this city, so I thought I knew it well. I was so used to it that I could not see its most striking facets, including the every day. The biggest surprise I got from Pisa was when I left it to attend University in a different city, in Ferrara. After being away for long periods of time I realized that walking down those same streets I noticed details and ambiances that I had never noticed before. Ours was a sort of courtship during which Pisa let herself be portrayed in her most intimate and simple moments. Rediscovering my native city was the biggest emotion I felt... It's almost a paradox. Do you have any favorite parts of the city? If so which ones and why? are they featured in the show? My favorite area is called Lungarni, the streets that embrace the Arno river. The city owes its development to the river and its proximity to the sea in medieval times. Still today, the river is tan area that welcomes prestigious buildings and offers wonderful views of the city. Oftentimes those luxurious noble palazzos are mirrored perfectly in the docile water of the river... in other moments those reflections are washed away by the tide. Furthermore, the light seizes the buildings, the water and its reflections, every time in a different way, depending on the season and on the time of day. Great part of the exhibition is dedicated to the Lungarni area and its palazzos, its bridges and those reflections in the water, either during a foggy day, a sunny one or an unusual morning of snow. How did you have the idea to put these images together? I never really planned on grouping all my images together, it just happened. It came to a point when all the material I had was so vast and confused that I had to organize and catalog it all. It all came together in the book “Emotions from Pisa,” published by Felici Editori and featuring a preface by professor Howard Burns. The show at Casa Italiana followed. It is a small “taste” of my photographic collection, a collection that hopes to wake up the distracted observer and take them through an unusual stroll through Pisa, my city. Enjoy the ride. Bon voyage. We learn by walking through the show and by reading the information on the photographer's web site (www.stefanopasqualetti.com) that the pictures can be grouped into a few different categories. Texture – Images of the beauty and intricacy of different surfaces, from the bricks of the Chiesa di San Zeno to those in Via San Martino. Skyline – Images of the outlines of buildings against the background a uniquely colored sky. Among them we find the Monumental Cemetery shot at 5:25 am or the Chiesa di San Matteo shot at 5.30 am.